I thought I'd mention another old game that probably has escaped the view of people not in the GameMaker community, Destruere Pizzicato (Or how I was a pizza cutter in 2D land). 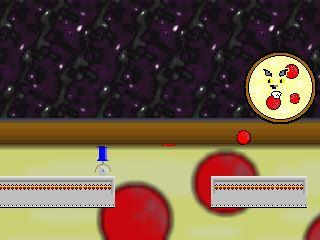 It's a quirky little platformer where you play a pizza cutter. One could say it captues the spirit of Pizza very well. Very short, and only 0.7 MB. If you don't mind something lacking a bit of spit and polish it's worth a download.